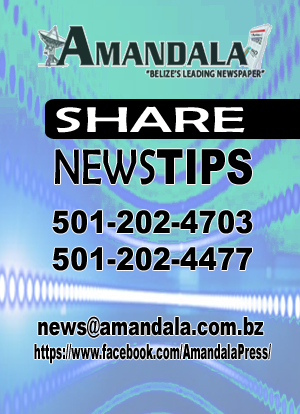 BELIZE CITY, Fri. Sept. 1, 2017–The top two-seeded teams, Dragons and Bulldogs advanced to the semifinal round of this year’s Interoffice Basketball, following wins against Belize Telemedia Ltd and Infotel, respectively. With the 94-77 win over BTL, the top-seeded Dragons now head into uncharted territory against a battle-tested Tuff-e-Nuff team tomorrow night at the St. Martin De Porres gymnasium. The Dragons, who essentially led wire-to-wire, had three players scoring in double figures. Cordel Gonzalez Jr., had 18 points 4 rebounds in twenty-eight minutes of play, while Andrew Vasquez chipped in with 17 points 5 rebounds 4 assists and 2 steals. They also got plenty of help, as Akeem Watters had 16 points 6 rebounds 2 assists and 4 steals. Lennox Bowman led BTL scoring with 17 points on 6-of-15 shooting from the field, followed by Lennox Cayetano and Jason Vasquez hitting for 15 points apiece. 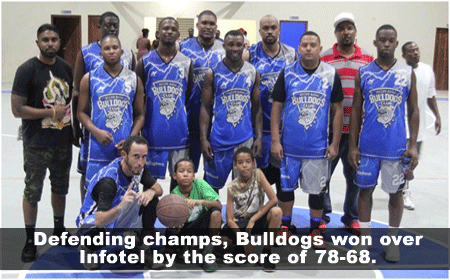 The defending champs, Bulldogs eliminated Infotel/Mars with a 78-68 victory. Roderick Williams had 26 points 3 rebounds 1 assist, while shooting 9-of-23 from the field; Roscoe Rhys added 20 points 2 rebounds 3 assists, followed by Aleem Richardson 15 points 4 rebounds 2 assists. The Bulldogs were up by 18 at halftime in a game that was over quickly. The win sends them to the semifinals against Central Health. 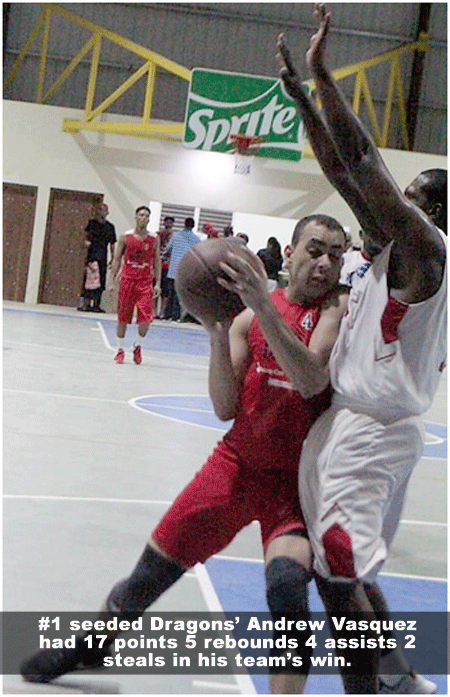 Elvis Olivera led Infotel/Mars with a game high 38 points 11 rebounds, followed by Earl Johnson 11 points 11 rebounds. 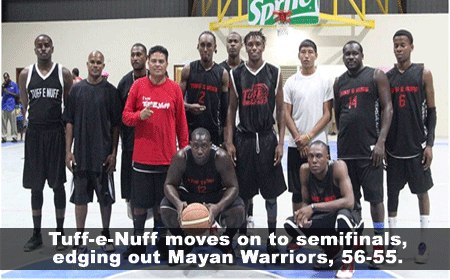 Meanwhile, in another quarterfinal match-up, Tuff-e-Nuff squeezed in a berth to the semifinals, following a hard fought come-from-behind 56-55 win over Mayan Warriors. Tuff-e-Nuff, who were down by 9 points with five minutes remaining in the fourth, miraculously managed to outscore their opponent 13-to-3 in the final five minutes, to record the one point win. Raul Roches recorded a double-double, totaling 16 points 11 rebounds; while Rico Black and Justin Wade finished with 9 points each. Kevin Lorenzo led the Warriors with 12 points, followed by Winston Pratt 11 points and Raymond Gongora 10 points. Central Health won handily over Kings, 81-63, and as a result now advances to the semifinals to face the defending champs, Bulldogs. Central Health had four players scoring in double figures, led by Neil Nicholson and Faisal Ahmad 16 points each followed by Keith Pollard 13 points, and Steve Wade 12 points. The Kings, who were playing without the services of arguably their best player in Jacob Leslie, were led by Leon Williams 13 points 6 rebounds, followed by Jorett Jones 11 points 4 rebounds, and Farron Louriano and Marshall Nunez, Jr. 10 points each.